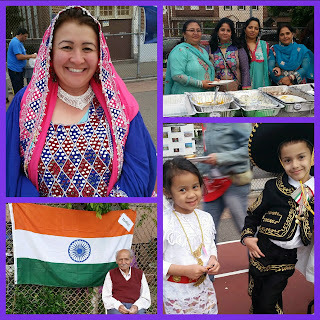 And here comes the Culture Night at PS122, Astoria, Queens. . It's the annual international gathering at Bo's (and soon will be Obi's, too ;)) school here in PS122. Well organized by the Parent-Teacher Association, or famously known as PTA, this event has been conducted for 10th times and what a fun night it was! 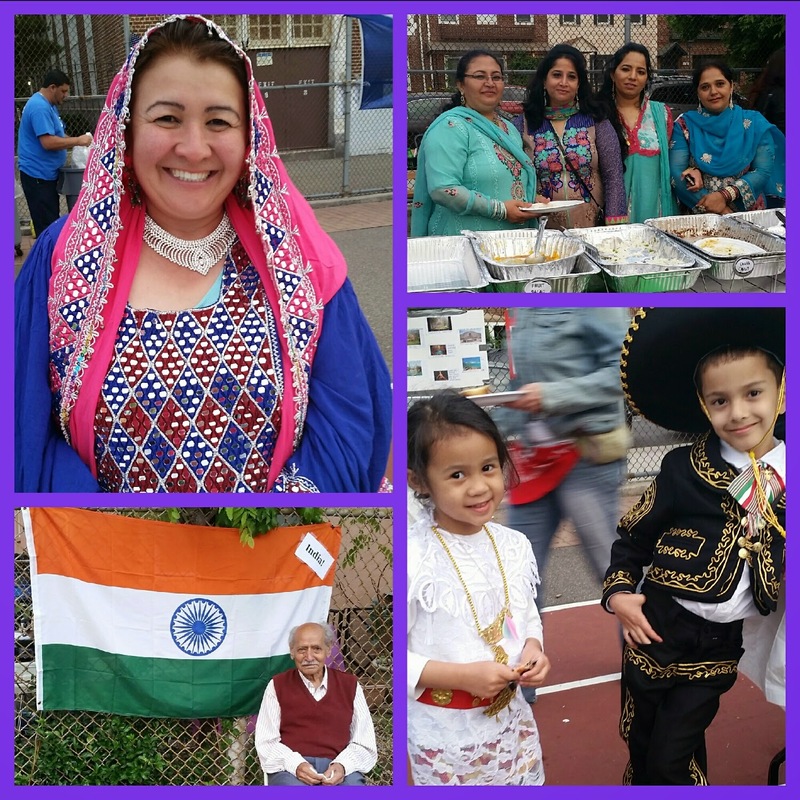 Celebrating the rich and diverse cultures of PS122, the culture night soiree surely attracts many. 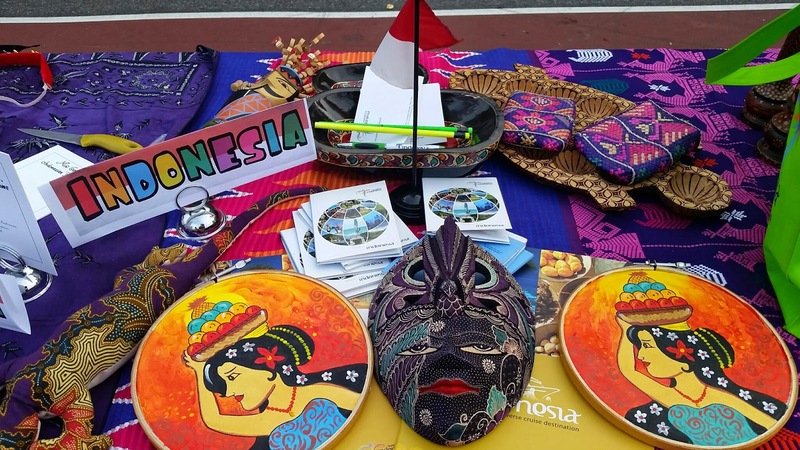 So I decided to organize a table, bring some Indonesian food, and donate three goody bags filled with Indonesian handicrafts and food products for the raffles. The event started at 6.30. Parents and everyone were welcome. They only need to pay a $5 entry ticket where they would get a plate and cutlery. Raffles ticket is $2 each or $12 for 10. All the proceed will go to the school. Getting all our stuff ready, Bapak took us to the school and helped us with the preparation. We had all our colorful handicrafts to be displayed on the table as well as some mini souvenirs for those who come to our table, thanks to Tante Chichi :). Not to forget my wastra collection, to show how colorful Indonesia is :). We actually brought a special background with Komodo dragon picture on it, but the wind was so strong so we decided not to use it. So was my gawangan, as I was afraid the strong wind would break it. Of course, food are the essential part of this display and I have my home-made nasi uduk or the typical Indonesian rice cooked the coconut milk. lemon grass and bay leaves, as well as Indonesian fried noodles. I have to admit I stayed up late cooking 3 batches of nasi uduk and mie goreng :). Luckily I got Udi staying with me watching stand up comedy :). 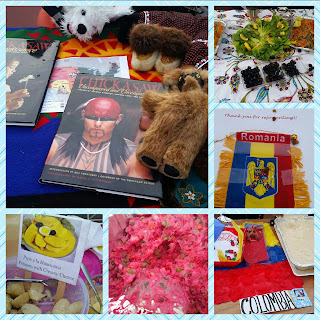 Visitors were coming, roaming around deciding which food they wanted to taste and asked around about the countries. Obi and I were so busy chatting and serving food for those coming to our table. Some knew Indonesia already, some came there for vacation, some knew it from TVs. We have Bo's teachers coming and the Principle as well as other teachers, too. 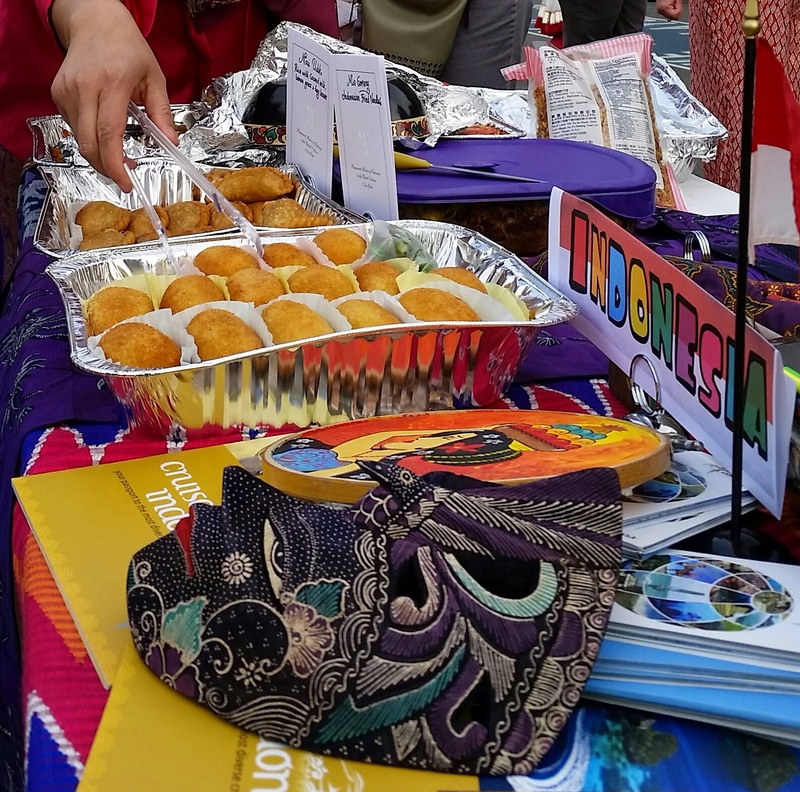 We also met some Indonesian families as well...one just came less than a year ago, just like us, and one had been in the US since they were born :). Too bad I didn't take picture with all of the them. After approximately an hour, most of our food were gone, only nasi uduk left :). Then we managed to sneak out and browse around ourselves before they cleaned the tables! 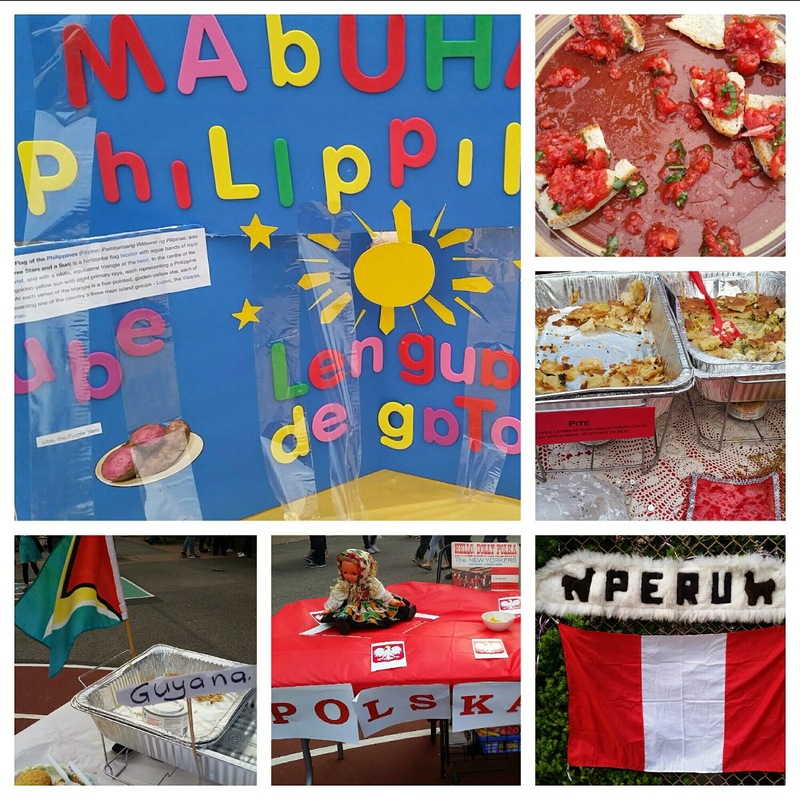 Well...most if the food were gone, but a we still enjoyed exploring the various display of cultures. Everyone got creative...not only displaying food but also wearing beautiful, traditional dresses with all those amazing accessories. Some, like us, also displayed some traditional handicrafts, fabrics, books and many interesting objects related to our beloved hometowns. 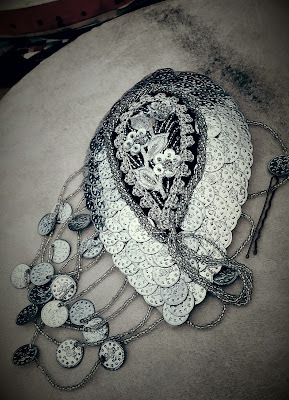 We saw dolls, tea set, jewelries, heirlooms, traditional costumes, toys and many more. They also had some performances in the middle of the yard. Too bad we watched them from a far, from our table hehehe...But we are determined to come back again next year! With more yummy food, more goodies and more fun :). We went home feeling tired but with happy, full tummy :). Have you joined similar event? Did you enjoy it? 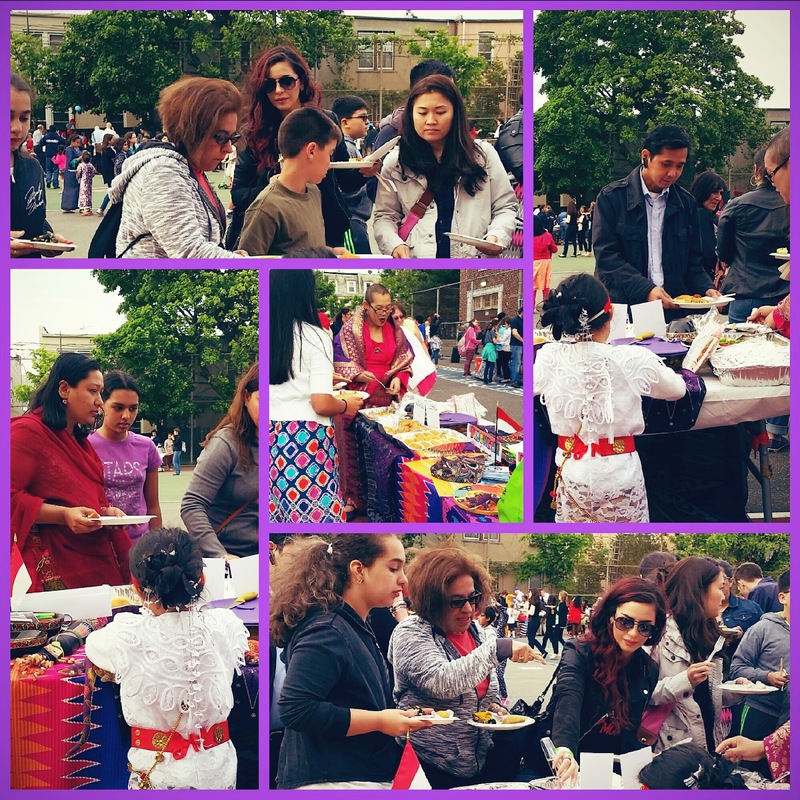 What did you like most... the food, the costumes, the crafts or else? Wow, yum. This food sounds delicious. It sounds like it was a fun event. I love the traditional attire. How fun! My brother & sister in law live in Astoria! Waah... Nasi uduknya bikin sendiri ya maak... Rajiiin, itu obi cantiik bgt euy! The only Grandma I knew on my Dad's side was from the Philippines. 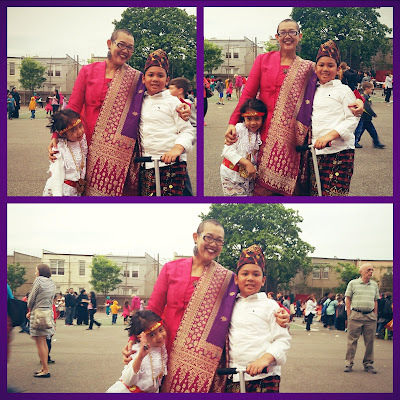 It was always fun going to their cultural events. My Grandpa didn't get married to her until after my parents were married. I remember my Dad not really wanting to go to their events. He felt a bit like an outsider. As a kid I enjoyed it. All the colors, different foods, pretty outfits, and dancing was fun! Wonderful tenderness, joy, beauty and happiness in these beautiful portraits! 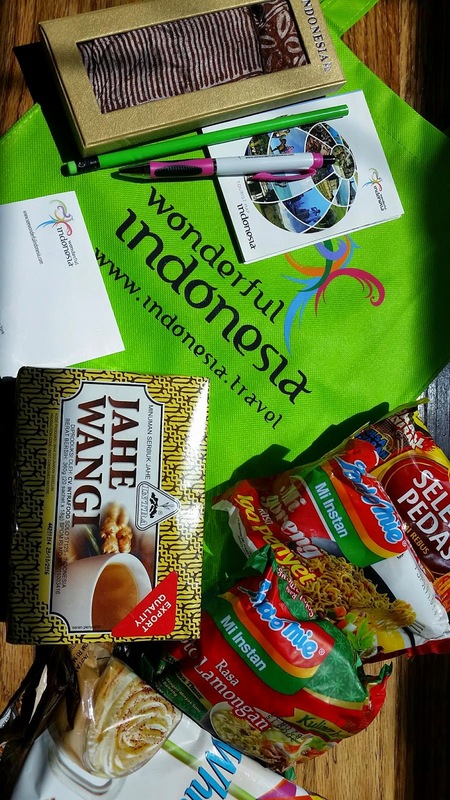 Ini yg di IG tadi ya? So colorful dan cheerful. Love it.